Ann Arbor market data in the last 3 years. I hope you can read this because it is truly incredible. A friend in my office has been composing data for us and using data from the Ann Arbor Area MLS. Today I was reviewing it and wanted to point out a few of the things I noticed. 1) In August 2010, there was a 9.0 month supply of inventory vs August 2013 there was a 3.0 month supply of inventory. 2) In August 2010, there were 2361 homes available to buy in Ann Arbor. In August 2013 there were 1032 homes to buy. 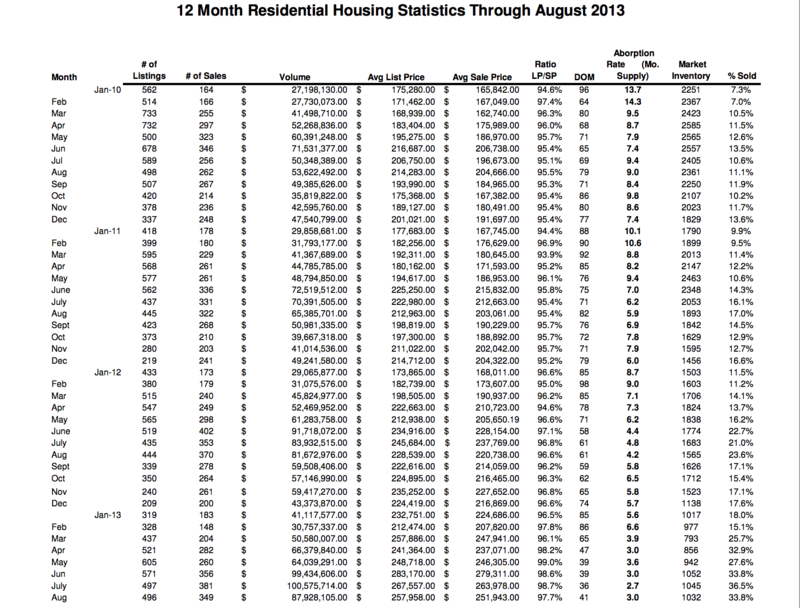 3) 11.1% sold in August 2010, yet in August 2013 33.8% of homes sold. This has been only 3 years. I started to experience the market stabilizing in 2011 and the market data below reflects that. I am excited to see what is going to happen during our Fall and Winter months. Try my new Ann Arbor Home Search site out, it is Google + meets Facebook and Pinterest. You can like any photos, comment on them. Invite your friends into your own private circle.